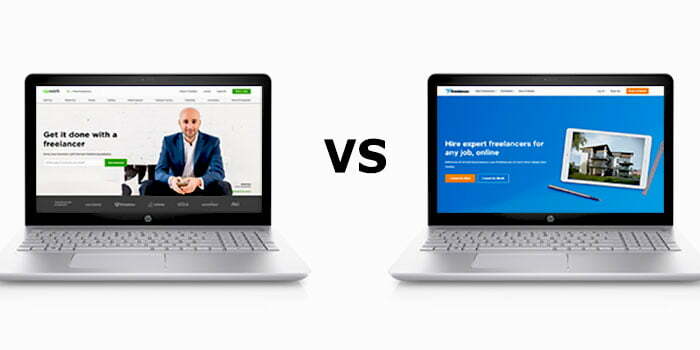 You are at:Home»blog»Upwork vs Freelancer: Which One is the Best in 2019? Before start working as a freelancer, most of the people want to know the fact: “which freelancing marketplace is the best”. Upwork.com and Freelancer.com both have become the freelancing marketplace giants in the world. Both of them have some pretty good features and policies which can help a freelancer to make some real money. But if you are new in the section of freelancing and still are confused about where you should bet your money on, then this article is for you. 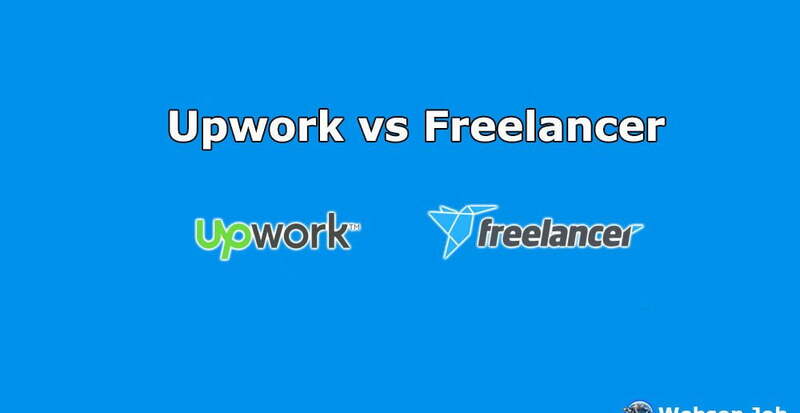 Here you will find everything you need to know about Freelancer vs Upwork in 2019. After reading this article which is basically a comparison-contrast blog, you will understand clearly which one among these two is simply the best. I have written this article based on real life experiences on working for both of the platforms. So, let’s get started! Upwork was firstly known as the Elance-oDesk in its inception. It is a global freelancing platform where millions of freelancers and contractors meet and work remotely. Its current headquarters are in Mountain View, California, United States. 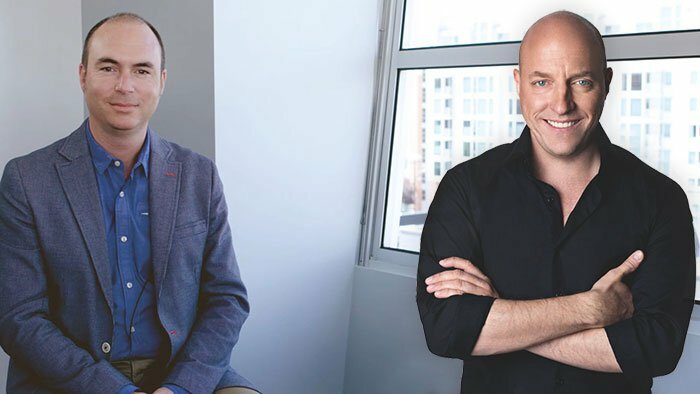 Its founder members are Stratis Karamanlakis and Odysseas Tsatalos. Elance-oDesk was rebranded as Upwork in 2015. Since then till today, Stephane Kasriel has been working as its CEO. A claim by Upwork clearly states that their marketplace now has more or less 9 million registered freelancers and 4 million registered clients. On Upwork, you can find 3 million job postings worth $1 billion per year. But they believe that because of their easy and trustworthy marketing policies, this number will boom by the double or triple compared to its current figure. From its definition you can clearly understand that Freelancer is also another free lancing platform that works almost like Upwork. The inception year of Freelancer is 2009 and since then till today, its headquarters is located in 680 George Street, Sydney, Australia. The other offices of Freelancer are situated Southern California, Vancouver, London, Buenos Aires, Manila, and Jakarta. Its founder and CEO both is only one person named Matt Barrie. But when it comes to Freelancer, they claim that the platform now has been regularly working with an astonishing 15 million registered members who have posted more than 7.4 million projects. The price of the projects in cash? More than $2.2 billion per year. This huge turnover for Freelancer has been possible because of their several subsidiaries like Freelancer.com, Escrow.com, Warrior Forum, SydStart, Freelancer Technology Pty Limited and many more. Upwork uses an easier and clearer user-interface than Freelancer. You can use its necessary navigation options easily. The navigation option includes a centralized notification system for contractors which has a message center and settings option. If you need Upwork Cover Letter Samples, you may visit. If you visit a job posting on Upwork as a freelancer, it will provide you necessary client information including rating, open jobs, reviews, average hourly rate, spending etc. You can also find so many search filters here according to job’s category, subcategory and other filter options. On the other hand, if you visit as a client, you see that job posting is so much easy. You will also get a job posting assistant. You can also invite the right person to apply for your job. Roaming around Freelancer for job postings sometimes can be a real disturbing effort as they put so many navigation links and even promotional widgets like Freemarket and paid plans on the dashboard. This unnecessary feature makes the page congested. Just like Upwork, It also has a long list of categories and subcategories. Freelancer’s project listing pages are also similar to Upwork but they show the job titles with different colors all in the same front. It would have been much appreciated if the project headlines were in larger fonts like Upwork. Another thing that freelancer lacks in is its filtering system is “it is slower than Upwork”. But hey, Freelancer has a very good feature that Upwork doesn’t have. If you look at a job posting on Freelancer, you will find less information about the client. But it doesn’t matter that much because, on Upwork, you need to pay the company to know the current bids on a project and it’s totally free on Freelancer. Also it is possible to keep the trace of your client in Freelancer. Upwork and Freelancer have both free and paid plans. But which one is better? Let’s find that out! The Upwork basic plan which is mainly the free membership plan, will offer you 60 points or 60 ‘Connects’ per month. But what are the uses of these Connects? Connects are like a currency on Upwork if you want to apply for a job posting. Every time you apply for a job, a certain amount of Connects gets exhausted from your account. If you subscribe to a $10 per month fee plan, it will increase the default Connect points to 70 with carry forward ability up to 140 points which means you can apply for more job postings. Getting a paid membership scheme on Upwork has some other benefits also. One of the benefits is it lets you see competitor bids which is unavailable in unpaid membership schemes. Then it comes to the percentage fee. 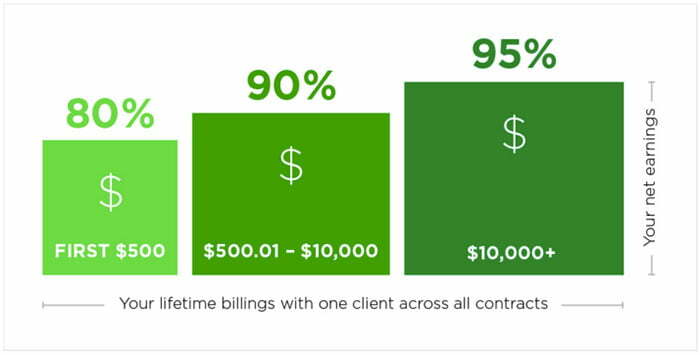 Upwork charges 20% from your payment if the budget is below $500 but if you can manage to get a payment over $501, your percentage fee decreases to 10% which is in a way, better for those who prefer to work for long projects. And after earning $10K, it will charge only 5% fee. You will also find disbursement fees varied by withdrawal methods on Upwork. But the best free benefit of Upwork is its skill tests which can be taken for free which helps you to illustrate expertise. Freelancer.com has a wide range of membership plans starting from $0 to $199.95 per month. Freelancer also takes a percentage from your earnings which vary according to your subscription plans. But unlike Upwork, the Company charges $5 or more for one single skill test. Both Upwork and Freelancer will offer you jobs with diverse range of budgets which are categorized by hourly and fixed price contracts. From my personal experience I can say that on Upwork, you are likely to get more hourly job postings than Freelancer.com. If you are regular google user, then you may have heard a buzz on the web that often there are scam projects posted on Freelancer which I can assure you is true. In my early freelancing days, I was a victim of such incident where my client and his job posting was nothing but a hoax and it wasted a pretty good amount of time. Where time is money, these types of scams can be very much disturbing. But it is never the case on Upwork as it’s much easier to find better paying jobs when compared to Freelancer.com. This has been made possible by Upwork because of their better tools and user friendly policies. 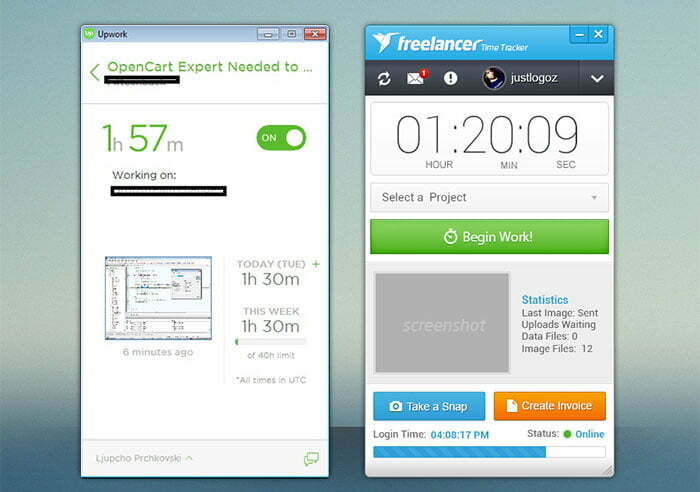 Both Upwork and Freelancer provide tracker apps to keep work logs with screenshots and task notes which are available for all types of operating systems including Windows, Mac and Linux operating systems. But if you don’t like their built in apps, you are always free to use third-party applications to log your work progress. These types of tools are cheaper for you as they are free most of the times and even if they cut money, the amount will be of just a few dollars per month or per person which is almost nothing comparing to 10% fee that freelancers usually have to pay to Upwork or Freelancer. Both Upwork and Freelancer have their own versions of mobile apps to connect clients and freelancers. But if you ask me, I would prefer the Upwork messenger app which is currently available for Android and iOS users. You can use this app to set status, send messages, handle job offers, get notifications and others. You can also use Freelancer’s official mobile apps on your Android and iOS devices to perform different types of works. These works include posting or bidding projects, find workers and clients, chat with freelancers and buyers and managing projects. Though it offers more features than Upwork’s mobile app, but again, it is so much complex that users loose their interests. If you ever visit Upwork, you will find that they have a long list of support system. The support provides assistance with live chat, phone line, ticket request system and FAQ items. Freelancer.com also offers FAQs, live chat, and ticket/email supports. But the sad part is, there is no phone helpline here. Actually, There is no such thing as the best or the worst here as Upwork and Freelancer both are online work sites who claim to be the ‘world’s largest’ freelancing or outsourcing marketplace. But In terms of the total number of registered users, Freelancer clearly wins as Freelancer scores 15+ million and Upwork has 9 million contractors along with 4 million clients in total, 13 million or more. But you shouldn’t forget that Freelancer has made this possible because of their several different subsidiaries while Upwork and Elance have announced a merger, which has led them to these numbers. Freelancer.com can provide its users a variety of features if you compare it to Upwork but its user interface needs more trustworthy improvements in order to make it interesting and user friendly. New freelancers and in some cases, also the experienced ones prefer to work on Upwork because Freelancer charges fees for most of its core features but Upwork has many free core features. Next, Freelancer’s mobile app offers more features than Upwork’s one but it’s never that much helpful users find so many features boring because of its complexity. Lastly, Upwork has more support portals than Freelancer. Based on my personal experience and the research of more than 50 hours that I invested to write this article, I would say that Upwork clearly stays ahead of Freelancer. Thank you very much and please don’t forget to share your opinion. thanks for the great list It was a very useful blogs that u gave to us. It’s really helpful. I was wondering about the best freelancing platform. Now I have come to a final decision by reading your post.